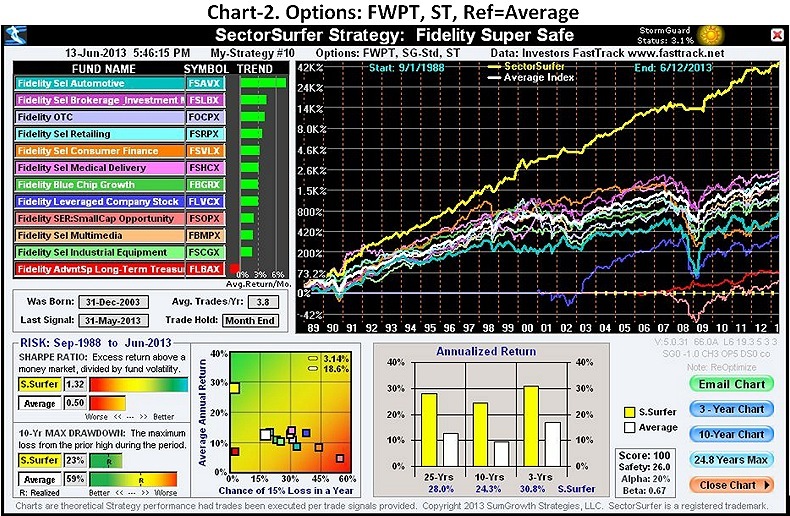 The Advanced Options for Strategies, which include Forward-Walk Progressive Tuning, are located on the Strategy Information popup window (shown to the right) accessed by clicking the icon next to the Strategy’s name on the Strategies Management page. Click the Show Advanced Options button to expose them as shown in the expanded popup window below. To revert to using only the standard AlphaDroid options, click the Restore Standard Options button, and click Save. The gold-standard for backtesting performance of a predictive algorithm (for markets, environment, sports, etc) is the forward-walk progressive tuning methodology where a first set of data is used to tune the parameters of the algorithm for use in making decisions during a subsequent period of time, after which the parameters are re-tuned using the additional data from the prior period, and then used to make decisions during the next subsequent period of time. And so on. If performance is maintained, then tuning did discover a reliable character. To the degree performance declines, it is because the higher performance path is un-discoverable by the algorithm. The path may be undiscoverable because significant events are too unpredictable, or because the algorithm lacks sufficient sophistication to adapt. Chart-2 is the same as Chart-1, but additionally has Forward-Walk Progressive Tuning (FWPT) enabled. You can see that the BornOn Date, as specified in the Advance Options screen above, is December 31st 2003. Starting on that date and extending to the end of the chart along the horizontal axis, there is a sequence of 18 yellow markers, each representing a date on which progressive tuning occurred. The progressive tuning interval is set for a minimum of 125 market days — just short of 6 months. The algorithm re-tunes itself only at the first available trade date after the 125 day interval so that no extra trades are induced by the process of retuning. Furthermore, if the Strategy is set for Trade Automatic, then re-tuning will respect any extended hold period that the currently owned fund may have and respectfully delay re-tuning until the next allowed trading date. The History-1 downloaded spreadsheet for this Strategy details the tuning profile for the Strategy and the record of its progressive tuning. This data is plotted in the charts to the right. The Strategy Tuning Profile has a nicely formed single peak that is easy to find and lock onto with a tracking algorithm. Shorter time constants are typical among sector-based Strategies, whereas it is not atypical for asset class-based Strategies, such as 401k Strategies, to have fairly long time constants. While most stock Strategies generally peak in the mid-range, if the stocks are generally well behaved the time constant may be considerably shorter, and if there is a lot of chaotic behavior then performance may peak with longer time constants. It is definitely possible to create a Strategy that does not have a strong peak, or that has multiple peaks. 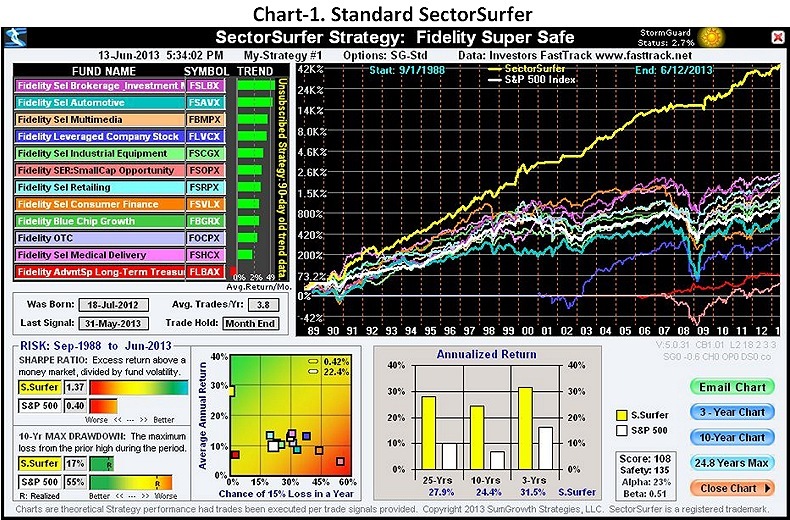 A Strategy with multiple personalities may relate to chaotic behavior of its stocks/funds, or may relate to an evolving character change, such as when a Strategy has funds with longer histories that are more like sectors and also has funds with shorter histories that are leveraged or of a very different asset class. 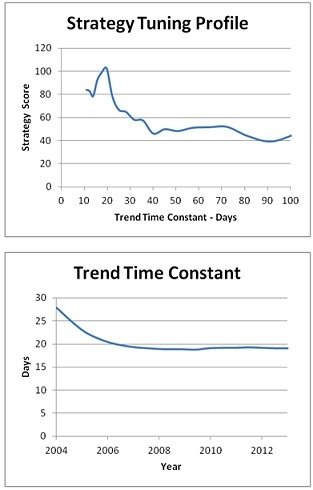 The Trend Time Constant chart shows that this Strategy originally tuned best at about 28 days, but then evolved and stabilized at about 19 days. While the root cause of this change for this Strategy has not been formally determined, it is notable by viewing Chart-1 that a few new funds do enter the picture later in the overall time span. One might also postulate that the character of the market may have changed during this time span due to the advent of electronic trading. But, it is also notable that many Strategies with only long term mutual funds do tune consistently across the full time span. This specifies the initial tuning date for the FWPT algorithm. You can specify it as any date from 1/1/1998 through the current date. The algorithm may slightly modify the date to move it to an actual market date, and it may also modify it if there is not at least 5 years of tuning data to start with. The somewhat arbitrary sounding choice of 5 years is intended to ensure that training periods will likely have a worthy set of market conditions from which to determine operational parameters. BornOn Dates 1/1/2004 and 1/1/2010 are particularly recommend. Each closely follows, and thus includes a full market crash/recovery cycle in its training data set. Stronger filtering makes an attempt to better expose the trend signal by passing it through the trend filter one additional time. The majority of Strategies do not require this treatment. Although an automatic check is made during Strategy optimization when FWPT is not selected, it is not automatically considered with the progressive tuning process because of the added complexity and thus is only accommodated in FWPT manually via the option checkbox. There is no simple rule of thumb for applying it because it includes the complex task of considering the similarities and differences of the volatility and correlation characteristics of the Strategy funds. It is just so much quicker to click and try it than to attempt to predict it’s need. As already stated, it is an option that only occasionally is helpful. If you have a standard AlphaDroid Strategy that is not tuning well under FWPT, particularly when you set the BornOn Date to today, that would be a good sign that you should try this. Strategies that evolve over time as additional funds with a shorter history enter the mix may also change their tuning profile over time as a consequence. Consequently, some Strategies may have two separate “time constant zones” where performance may be similar. Experience with dozens these kinds of Strategies indicates that biasing the decision toward choosing the shorter trend time constant more often results in the algorithm being more adaptive and responsive to market changes as the algorithm walks it forward in time. Thus, this option is checked by default. That said, it is possible to build Strategies that actually evolve to prefer longer time constants as the mix of participating stocks/funds changes over time. For example, a nice sector rotation strategy may originally tune well with shorter time constants, but the later addition of other asset classes (such as materials, interest rate dependant REITS, leveraged bonds) could drive the Strategy to later prefer longer time constants — which would be a reason to not bias toward shorter trends and uncheck the box.